Endless beauty from the Rocky Mountains is inescapable at Camden Interlocken in Broomfield with breathtaking views around every corner. Each open-concept, pet-friendly one and two bedroom apartment home at Camden Interlocken features stainless steel appliances, quartz countertops, hardwood-style flooring, modern white cabinetry with nickel finishes and a private balcony/patio to add to your living experience. Bask in the sun by our stunning resort-style pool, complete with outdoor living areas and a sauna, or work out anytime in our 24-hour fitness center. With free WiFi access, our business center helps you stay connected and productive. And, our onsite playground and dog park keep the fun going for every member of the family. 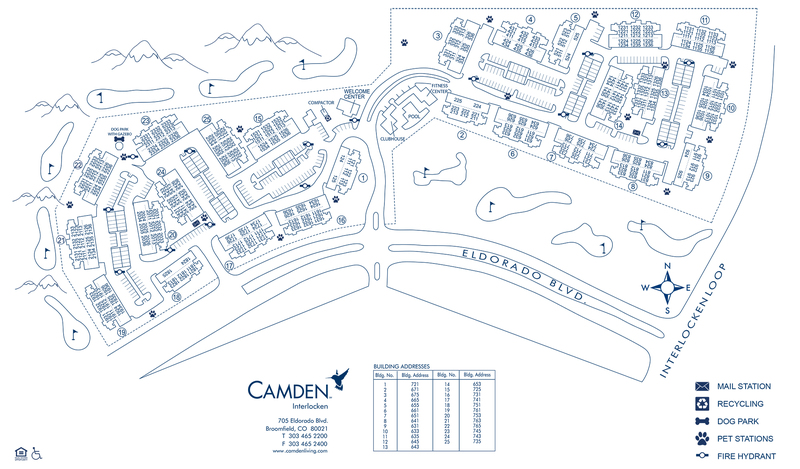 Conveniently located off Highway 36, Camden Interlocken is twenty minutes from Downtown Denver and ten minutes from Boulder, making our spectacular apartment community perfect for both city lovers and outdoor adventure seekers. Enjoy the surrounding open space - walking, hiking or running alongside pristine views of the Flatirons Mountain. Residents enjoy direct access to Omni Interlocken Golf Course, concerts at the 1st Bank Center and shopping at nearby mega-mall FlatIron Crossing. And just within walking distance is a Walmart Supercenter to take care of all of your grocery needs. Additionally, our residents receive a technology package up to 47% off retail included in their monthly rent with high-speed internet up to 150 Mbps and over 140 digital channels through Xfinity. Stop by anytime, we can’t wait to show you around! Read more about Camden Interlocken from the Simply Camden blog. We'll save a spot for you! We offer one garage per apartment home. We have ample open parking for our residents and visitors on a first-come, first-served basis. Reserved parking is available for $40 per month.